Proud of its railway-related past and present, Town of Mount Royal owes its existence to a handful of bold visionaries who imagined a community where melon fields then stood. Decades-old urban planning traditions can still to be seen in the design of the Town’s road system and abundance of green space. These days, it is issues related to residential architecture and protecting our heritage that prove the most challenging for the Town. The Town’s founding is directly related to the digging of a tunnel under “the mountain” – Mount Royal’s namesake – by the Canadian Northern Railway, a tunnel that would give CNR trains access to downtown Montreal. To raise funds for the project, the company decided to create a model city at the northern end of the future tunnel on land that, up to then, had been used to grow the Montreal melon, a fruit prized at the turn of the 20th century but rarely seen today. It was under the leadership of the owners of the Canadian Northern Railway, Sir William Mackenzie and Sir Donald Mann, in collaboration with the CNR’s chief engineer, Henry K. Wicksteed, that the urban development project was launched in 1910. Landscape architect Frederick Gage Todd (1876-1948) was hired to draw up the plans. In doing so, Todd was inspired by progressive urban planning movements, in particular the City Beautiful and Garden City movements. The Town was officially incorporated on December 21, 1912, and the first passenger train rolled through the tunnel in 1918. Starting from nothing, the Town grew at a steady pace over the following decades, through two world wars and successive administrations, but always adhering to Todd’s plan. 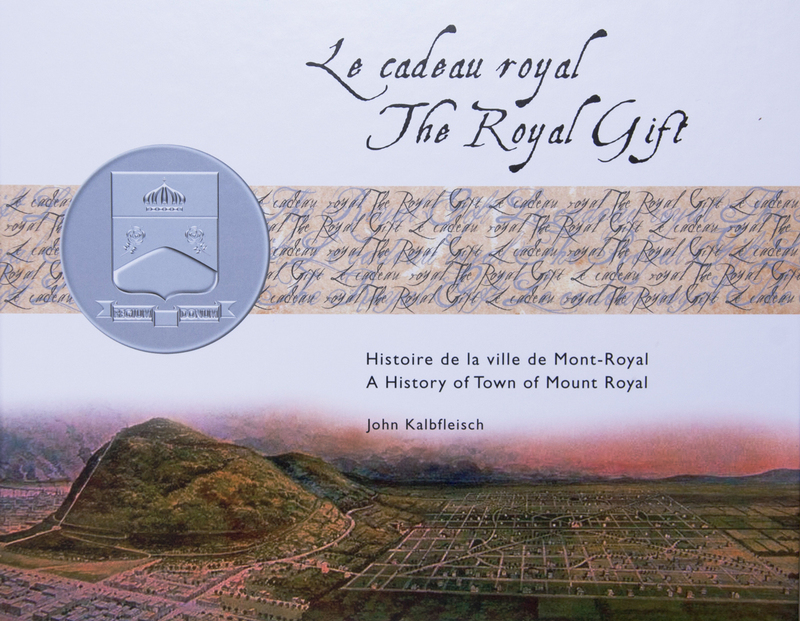 Commissioned on the occasion of Town of Mount Royal’s centennial in 2012, The Royal Gift is a magnificent, richly illustrated, 250-page hardcover book. It tells, decade by decade, the fabulous story of the Model City. Preparing it elicited generous contributions from residents, who enthusiastically opened their family albums and shared many memories with us. The Royal Gift can be purchased at Mount Royal’s Town Hall during regular business hours for $35, including taxes. You will also find copies for sale at the Reginald J. P. Dawson Library (1967 Graham Boulevard) and the Recreation Centre (60 Roosevelt Avenue). Place names today are an integral part of the urban landscape. Toponymy – the study of place names – reveals the various stages of the municipality's development. 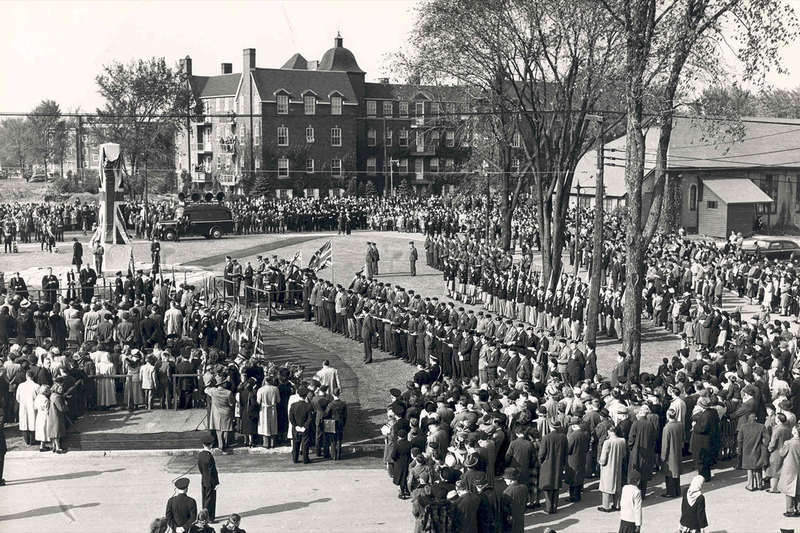 The name Mount Royal reflects, in part, the Town’s railway-related roots. Collected in a useful PDF file, our toponymic information is adapted from a document titled Toponymic Heritage: Streets and Public Parks*. *Mario Nadon, Toponymic Heritage: Streets and Public Parks (Town of Mount Royal, Quebec: Town of Mount Royal, 1995), 59 p., ISBN 2-9804727-0-0. The royal crown, of French origin, is enclosed in the top panel and blazoned with fleurons. Two heraldic roses, of English origin, are stylized wild roses with two rows of five petals separated by pointed sepals. The stylized mountain refers to the Town’s geographic situation at the foot of Mount Royal. The outline of the shield ending in a point recalls the shape of the shields of ancient Greece and Rome. Together these components form the official coat of arms of Town of Mount Royal and symbolize our ancestral attachment. Town of Mount Royal’s official signature includes the coat of arms as well as the Town’s name in French and English. The coat of arms has evolved over the years; the current version dates from 1993. Our Site Planning and Architectural Integration Program (often referred to by its French acronym, PIIA) identifies eight distinct styles of houses grouped into the three historical development phases of Mount Royal’s urban fabric. Together with the Planning Advisory Committee, the PIIA guides property owners in choosing architectural style and design of the materials to be used when, for example, renovating a home to ensure they are adapted to the fullest possible extent to the architectural movement and urban context applicable to the building concerned. 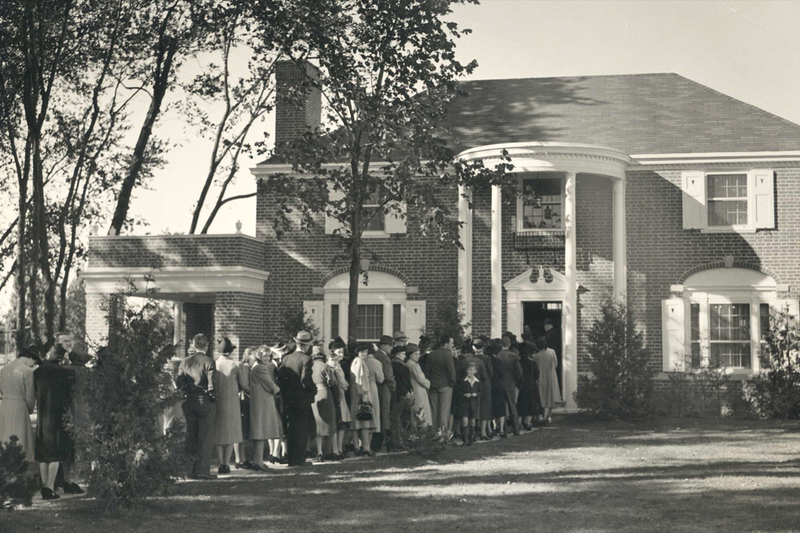 Interested in Town of Mount Royal’s history? Our archives are located in Town Hall and are open during regular office hours. Our archivist will be pleased to guide you in your research and answer your questions.